We held a chocolate contest recently and our winner was Suz from Cotswolds, UK; she won for her family’s delicious chocolate chili recipe. . Suz explained that she likes 2 tablespoons of cocoa powder in her chili but her hubby only likes 1 tablespoon. We made her chili recipe and tried it with the different amounts of cocoa. We too, were divided on how much cocoa powder we liked in the chili. Both ways it was a very good chili recipe. We chose a chocolate contest because chocolate is the most popular flavor and ingredient used all over the world. Everyone loves chocolate! People come in everyday looking for chocolate recipes to try; it might be for chocolate desserts like a tart or souffle, chocolate candy or even entrees which include this delicious ingredient. Gifts of chocolate are given for almost every holiday around the world; in Ecuador I received chocolate dipped strawberries for Valentine’s Day. How Delicious! For our chocolate contest, I chose using cocoa powder over other chocolates because I have never been without Hershey’s cocoa powder in my life. Many times in my life I could not afford to buy chocolate to cook and bake with but I always had cocoa powder. Cocoa powder is the dry substance of chocolate liqueur that remains after most of the cocoa butter has been extracted. It stays on the pantry shelf indefinitely and is more economical to buy. Although I love cooking with many different types of chocolate now, when you do not have chocolate you can make anything with cocoa powder and still be delicious. 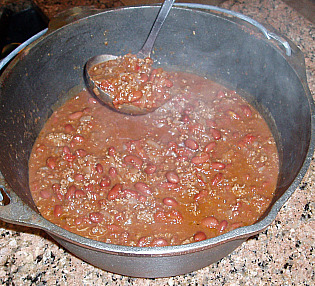 This is the winner of the chocolate contest; chocolate chili recipe. Combine ground beef and onion; brown in a heavy kettle. Add the beans, tomatoes and chili powder. Add 1 tablespoon of cocoa powder and stir well to blend. Simmer for a few minutes. Taste and decide if you want to add more cocoa. You don’t need a chocolate contest to practice using cocoa powder; try this delicious microwave chocolate pudding recipe. Combine sugar, cocoa powder, cornstarch and salt in a medium size glass bowl. Gradually stir in milk; microwave on high for 5 minutes stirring once half way through. Microwave on high until mixture is cooked and thickened about 1 to 2 minutes longer. Stir in vanilla and butter; pour into individual serving dishes. Press plastic directly on top of surface of pudding; chill. Makes 4 servings. My mother could have won any chocolate contest with her Hershey’s cocoa fudge recipe; this is the only fudge we made in our home when I was growing up. Mom’s was the best and sometimes she would stir in a little peanut butter; that was the best. Mom did not have the luxury of owning a candy thermometer but her candy was perfect every time. Thoroughly combine cocoa powder, sugar and salt t in a heavy saucepan; stir in the milk. Bring mixture to a rolling boil over medium heat stirring constantly. Boil without stirring until thermometer reaches 234F degrees on candy thermometer or the soft ball stage. Remove from heat; add butter and vanilla, DO NOT STIR. Cool fudge to room temperature and then beat until fudge thickens and loses some of its gloss. Quickly spread in a lightly buttered 9 inch square pan and cool completely. This would certainly win a chocolate contest for the best cakes. We use to make marble cakes a lot when I was young but I don’t see them much anymore. Combine flour, 1 ¾ cup sugar, 1 teaspoon baking soda, baking powder and salt in a large bowl. Add shortening, butter, eggs, buttermilk and vanilla; beat on medium speed for 3 minutes. Combine cocoa powder, 1/3 cup sugar, and ¼ teaspoon baking soda in a small bowl. Blend into cocoa mixture water and 2/3 cup of the vanilla batter. Pour vanilla batter into greased and floured 9 cup Bundt pan. Spoon cocoa batter on top; swirl with spatula or knife to make marble effect. Bake for 50 to 55 minutes or until tester comes out clean; cool 30 minutes and remove cake from pan. Prepare chocolate glaze and spoon over warm cake. Let cake cool completely. Combine cocoa, water, corn syrup and butter in small saucepan over low heat until mixture thickens. Remove from heat; stir in vanilla and gradually the powdered sugar. Beat mixture until smooth and thickened.